You've never seen a sunflower with colors like this! Our first-ever rose-pink sunflower! It is absolutely stunning in vases and the garden. Its combination of subtle lemon and rose-pink flowers surrounding a dark disc, forming 5-6" blooms, will leave you breathless. The plants are well branched for cutting and pollen free so they won't stain your furniture. Grow in average well-drained garden soil in full sun. Strawberry Blonde grows to 6 ft. tall, so make sure you select the right spot so as to not shade other sun loving plants. Sunflower, Strawberry Blonde Hybrid is rated 4.1 out of 5 by 13. Rated 3 out of 5 by cheeks from Chipmunks! Sorry to say, the chipmunks ate my sowed seeds. Maybe next year. 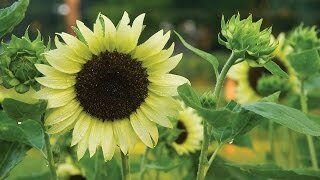 Rated 5 out of 5 by Merrywidow from Stunnng sunflower Talk, vigorous grower. Beautiful color! Long-lasting cut flower. Rated 5 out of 5 by preachermom from They thought they were fake! These are such vibrantly colored beautiful flowers that the cleaning crew thought they were fake! With these sunflowers, the flowers do just keep coming, like other reviewers, I have had to steak a few just to keep them upright. Rated 5 out of 5 by AdamBrownPhoto from Well-Branching is an understatment. These beauties were quite the treat to have growing in my yard. Everyone that saw them absolutely fell in love with them, and the flowers just wouldn't stop. In fact, I ended up having to stake a couple of them because they were so heavily-laden with flowers. I counted 15 on one stalk. The colors ranged from deep purple hues to barely-there bubble gum pink. Easy to grow, beautiful flowers, and prolific in their growth habits. Not spindly at all, even though they spread quite a bit. WILL DEFINITELY be growing these again this year. As a photographer, it would be hard to top these as subjects. Rated 5 out of 5 by Jess907 from Love these. Ordered these for my Mom last year and she Loved them. I thought the colors where way cooler then the plain sunflowers although sunflowers are still pretty cool. Burpees shipping is fast and easy and I'm sure I'll be ordering from them again real soon. Big Burpee fan. Rated 1 out of 5 by lvs3grdn from They're yellow Well - I planted them in a large pot not near any other sunflowers that they could have cross pollinated with - and - they're yellow, just like regular old sunflowers. They're not even a little pink. Did anyone else have this problem?